The RV Book (6th edition published Aug 2018) is being offered as an instant download e-book. For $17.95 (and no shipping & handling charges) you can enjoy instant access to this best-selling RV how-to book. 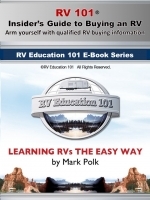 Mark Polk, author and producer of America’s most highly regarded RV training series, tells you everything you need to know before you buy your RV and everything you need to know after the purchase. The RV Book is packed with 16 chapters and over 290 pages covering every RV topic imaginable. This is not your typical e-book! No RVer, whether new or experienced, should be without The RV Book. Order your copy now and enjoy it instantly. This e-book is a large file and should only be downloaded with a high-speed Internet connection. Length: 47 pages- This is the best $14.95 you'll ever spend when you realize how much it saved you. If you’ve ever had questions or concerns about towing, weights, hitch work and backing this e-book has the answers. Mark Polk, the owner of RV Education 101, stated that he wrote this guide because these are topics that the RV consumer needs to understand so RVing can be fun rather than worriesome. The guide is packed with information on subjects like properly matching your tow vehicle and trailer, trailer weights, backing techniques that really work, proper hitch work, towing tips, driving tips, controlling sway, weighing your RV and much more. Mark, I wanted to personally thank you for all the education material you provide on RVs. I have purchased two of your e-books which came in very useful while purchasing our travel trailer. We are new to RVing and needed a LOT of education. I just finished watching your DVD on travel trailer/5th wheel info. I am feeling much more confident about taking possession of our 29' Puma tomorrow!! I have ordered a few more items from your web-site and look forward to watching them and learning more about rving. Thanks again for you do for the industry and for those of us who haven't a clue!! This e-book is a direct result of feedback from RV Education 101 consumers. We have had numerous requests to compile some tips that would be useful to RVers, regardless of their level of experience. Some of the tips are very basic and simple while others are more detailed and technical. There are tips that will save the RVer time and money, and some that will prevent untimely, costly repairs to the RV. Some of the tips are common sense, some you learn from experience, and some were passed on from other RVers. My six year old son (at the time) Tyler is an avid RVer. When he found out I was writing this e-book he wanted to contribute some of his own tips based on his RV experiences. I included Tyler’s Tips (in his writing & spelling) and for his contribution I dedicate this e-book to him. "Hello Dawn and Mark. I found your RV Education 101 web site. 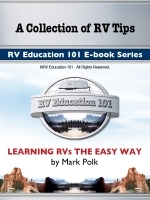 I downloaded the Collection (101) RV Tips E book. Wow, so much good information. Then I said to my wife, if the E Book is this good, I wonder how good the Tapes and DVD's must be. I ordered 3 tapes. THEY ARE GREAT and very informative. I want to take this time out and tell you both that I am happy that we have people like you both to help people like me. Again, thanks to the both of you. ...Plus how to install a window awning in six easy steps. If you have been around RV’s, you have probably heard many horror stories about RV awning mishaps. There was the camper who didn’t lower one end of the awning to allow for water run-off and the weight of the water, during a steady rain, tore the awning fabric from the side of the RV. There was the camper who decided to leave the awning out while they headed to the beach for a couple of hours. When they returned to the campsite they discovered the awning hardware and fabric was on top of the RV, due to a strong gust of wind from a storm that suddenly moved in. There was the camper, which in this case was me, who was driving down the Interstate and the awning tried to unfurl as we were traveling. In my own self defense it was because of a defective awning lock on our new RV at the time. And there was Robin Williams in the movie “RV” who left the campground with the awning still out, in an attempt to make a hasty retreat from his pesky neighbors. There are many other campers with many other awning horror stories to tell. My goal with this e-book is to make sure you are not one of those campers, with one of those awning stories to tell around the campfire.